Choosing wine glasses shouldn't be hard. But it is important! Nothing else makes so much difference to your appreciation of fine wine than having the correct stemware. While the correct wine tasting glasses can enhance a fine wine, highlighting its attributes and keeping it in balance, a bad wine glass can destroy your appreciation of a potentially great wine. If you are just getting started with wine and wine tasting you may feel intimidated by all the choices. And besides, most of us can't afford to go out and buy 20 different types of glasses. We will address all of this for you so that anyone, from a new wine lover to a seasoned eonophile, can have an easy time choosing wine glasses that are best for their purposes and budget. Most fine wine shops have an excellent selection of stemware. Choosing wine glasses is easiest if you can see the glasses before buying and even hold them in your hand to see how they feel. Other stores that carry food-related products, like Sur la Table, Williams Sonoma, Bed and Bath, Crate & Barrel, and even Target, also have good selections of wine tasting glasses and other wine accessories. However, be very critical of the brands of glasses they carry. While we have seen great Riedel and other stemware sold at some of these stores, they can also carry glasses that are not ideally suited for wine tasting. Online, there are several places you can find glasses as well, as long as you don't mind paying shipping and not being able to see and hold the glasses firsthand before purchase. What Makes a Wine Glass Good? Appropriate wine glasses should do three primary things, they should highlight each wine's appearance, aroma and flavor. Therefore, first of all, when choosing wine glasses, a good wine glass should be made of a thin, clear glass. Avoid choosing wine glasses that are very thick, that are colored, or have etchings or other decoration on them. While these may look nice on their own, it detracts from the wine within. Second, when choosing wine glasses, the shape of the bowl should hold on to and focus the aromas toward your nose at the top. It should also allow vigorous swirling of the wine in the glass so that it can interact with air and volatilize so that you can smell the aromas better. These are all aided by a bowl shape which is big enough to swirl, but in a shape that tends to focus aromas upward to where your nose will be. Therefore, most wine tasting glasses have a tapered shape that gently tapers together as you go up the glass. Avoid glasses that are flared excessively at the top or taper outward, like a traditional Martini or Margarita glass. Third, when choosing wine glasses, the shape and lip of the glass also affects how the wine hits your palate and thus how you taste the wine. This can be used to your advantage in the shape of the glass, as we will see below. For example, focusing wine toward the tip of your tongue tends to accentuate the sweetness of wines and focusing further back toward the middle of the tongue de-emphisizes sweetness and accentuates acid. Most importantly though, the edge, or lip, of the glass should be as smooth as possible to allow the wine to glide into your mouth smoothly. Avoid glasses with a thick, rolled lip that cause turbulence in the wine and can lead to more harsh mouthfeel and flavors. Do these differences really make a difference for your appreciation of fine wine? The answer to that is an emphatic yes! We don't sell anything and particularly have nothing to do with the wine producing companies, so this is our opinion, not a line that we are trying to sell you. This has been proved to us over and over again. If you don't believe us, pour yourself a glass of a wine in a Martini glass and a good wine glass. 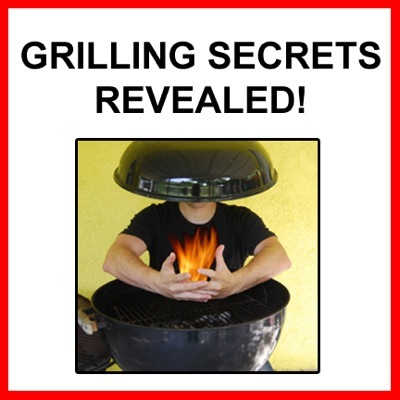 You won't be able to discern a fraction of the nuances of aroma and even flavor in the Martini glass. While this is an obvious difference, as your palate becomes more refined, you will start to notice subtle differences between one wine glass and another. It really matters! 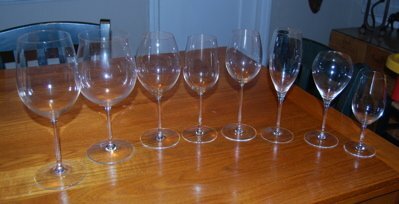 Do I really Need Separate Glasses for Every Type of Wine? While different glasses are ideal for different types of wine (Burgundy versus Bordeaux, Port versus Sauternes, Pinot Noir versus Zinfandel, etc. ), the differences are somewhat subtle. As long as you have an excellent all purpose wine glass, you will be able to drink and taste most types of wines well. So the answer to the question is no. For most of us, having 20 different types of glasses is impractical or too expensive. However, if you truly fall in love with this great hobby, if wine becomes a passion and you do anything you can to find your next wine epiphany, then having the ideal glass for each great wine you sample will become more of a focus for you as it is for us. Part of being a wine lover is being a collector. But we don't just collect the wines themselves, we also collect all the wine accessories, wine tasting accessories and other related paraphernalia that goes along with it. Let yourself be the guide. Start out by investing in a group of excellent all-purpose wine glasses and build from their as you see fit. If that serves your purposes indefinitely, then great. If not, then slowly add to your collection. But take it from us, choosing wine glasses correctly to match the wine can have a significant effect on your appreciation of each wine! 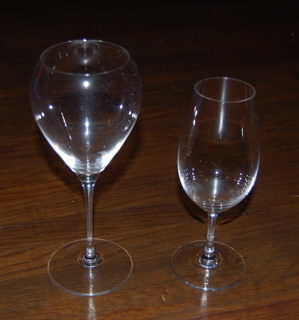 Champagne or sparkling wine glasses are generally smaller overall, with a tall, narrow profile as seen here. This helps focus a steady narrow stream of bubbles that look attractive in the glass. We personally prefer the more tapered types of glasses, like the ones of the left and right of this picture, because they help focus the aromas nicely and they allow some mild swirling of the wine. The glasses pictured here are all made by Riedel, the left being the Cuvée Prestige glass in the Vinum line, the middle is the Champagne Glass in the Sommelier series and the right is the Vintage Champagne Glass in the Sommeliers series. 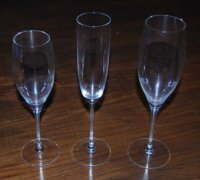 When choosing wine glasses, any of these are excellent for most sparkling wines. White wine glasses tend to be a bit smaller than their red wine counterparts but the same general principles apply. The Riedel Vinum Series Chablis (Chardonnay) glass pictured on the left is a good general shape for most white wines. The slightly taller and narrower Sommelier series Riesling Grand Cru glass in the middle is a very elegant glass and can also be used for some fruity red wines like Zinfandel. Finally, the tall Loire glass in the Sommelier series is beautiful as well. 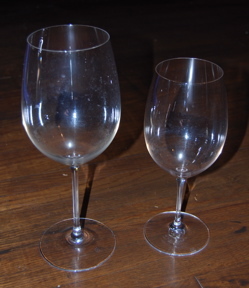 Bordeaux-styled wine glasses are generally a large, tall bowl. They are ideal for many types of full-bodied red wines but particularly for Bordeaux wines and other wines made from Bordeaux grape varietals, which include Cabernet Sauvignon, Merlot, Cabernet Franc, Malbec and Petite Verdot. The two glasses pictured here are the large and regal Riedel Sommeliers series Bordeaux glass and the smaller, but excellent nonetheless, Vinum series Bordeaux glass. These, particularly the Vinum series glass, can be used for other full-bodied wines like Syrah-based wines, Brunello and others. Therefore they make excellent all-purpose red wine glasses. Burgundy, a region in France, makes red wines primarily from the Pinot Noir grape which are very fragrant and seductive. The traditional Burgundy glass has a wide, large bowl which allows that aroma to expand up toward your nose, highlighting the complex aromatics of the wine. Also, because the wines are high in acid, the glasses often have a slightly flared opening to direct the wine toward the tip of your tongue, accentuating the sweetness of the flavors. 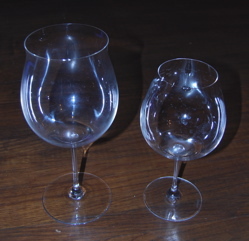 The glass pictured on the left is the Sommelier series from Riedel while the one on the right is Burgundy glass from the Vinum series by Riedel. Both are excellent Burgundy glasses and can be used for any aromatic red wines including red Burgundy, Pinot Noir, Nebbiolo, Barolo, Barbaresco, Tempranillo and others. Sweet wines vary considerably depending on the type and style, from light, fruity white wines to dark, smoky, full-bodied reds. While it is hard to generalize across all these differences, most sweet wines are served in relatively small glasses. 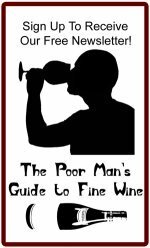 This is primarily for the reason that people tend not to drink that much of a dessert wine, just sipping on a small glass after dinner with dessert, with nuts and cheese or alone. In general, there are two separate types of dessert wines, red and white. White, sweet wines like Sauternes and late-harvest Rieslings and Chenin Blancs can all be served in a glass like the one on the left, the Riedel Sommeliers series Sauternes glass. It has a tapered contour which focuses the wine toward the middle of your tongue which emphasizes the acidity and de-emphasizes the sweetness, keeping the wine in balance without being cloying (excessively sweet without acid, like a cough syrup). We love this glass and feel it is ideal for very sweet white wines from most regions. The glass on the right is the Riedel Sommeliers series Vintage Port glass. It is ideal for port wines, red dessert wines from Portugal, as well as other dark, full-bodied, sweet red wines (such as Madeira, Marsala and others). 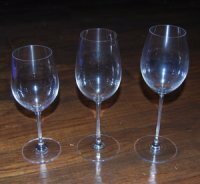 We hope this information helps you in choosing wine glasses for your home or wine tasting party. While it can be intimidating at first, the more you taste, the more you'll see the effects that good glassware can have on your fine wines. As we said before, start simple, with a good all-purpose glass, and then build up from that if you feel the need and desire. Good luck choosing wine glasses that fit your budget, needs and style! Done learning about Choosing Wine Glasses? Return to the Wine Accessories page.